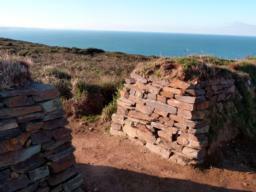 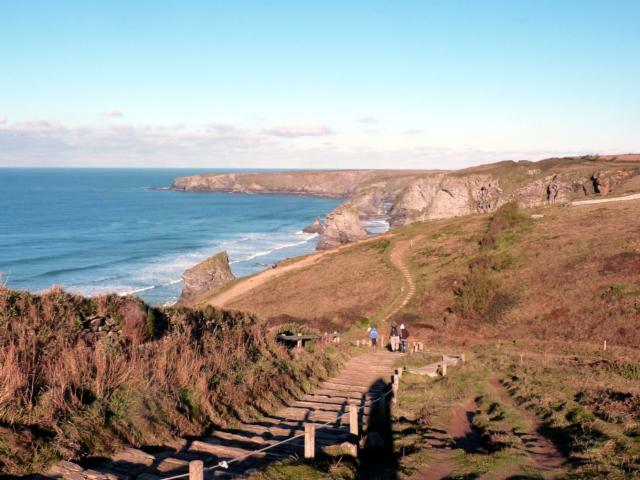 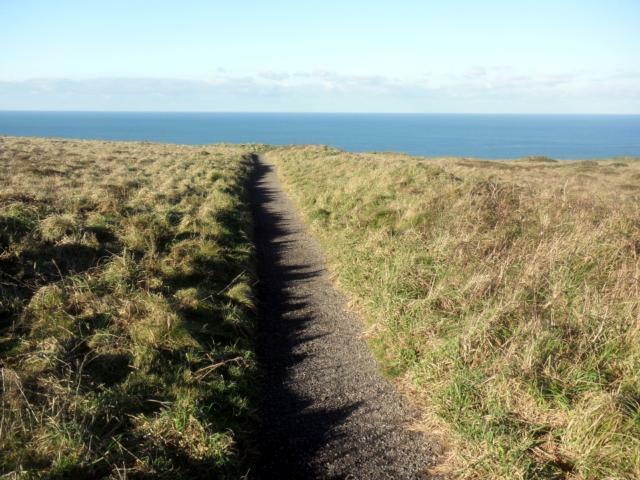 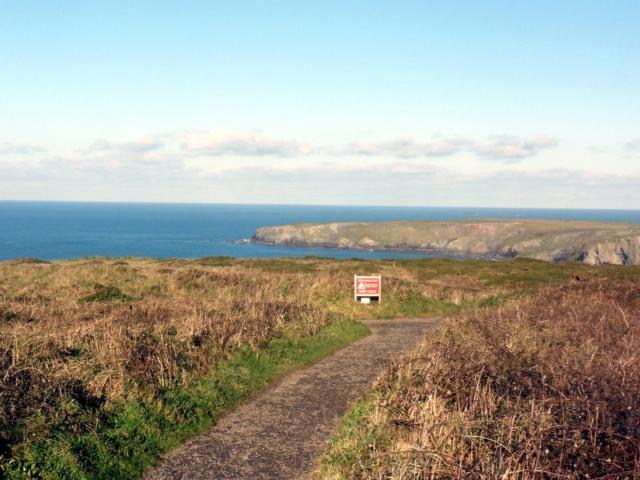 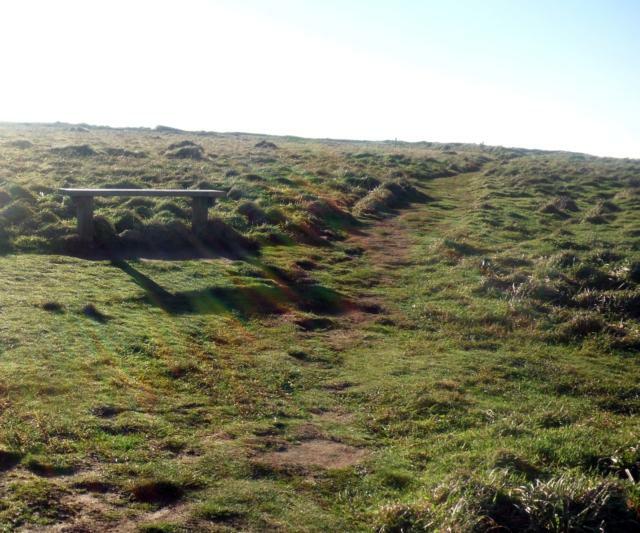 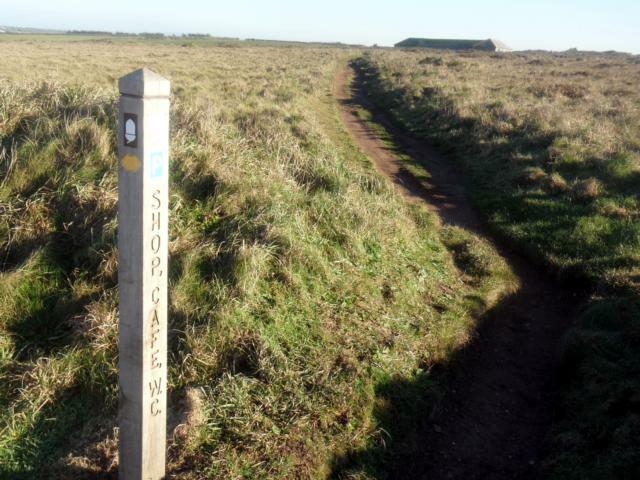 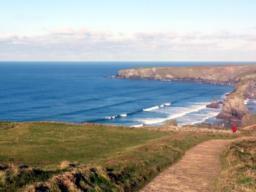 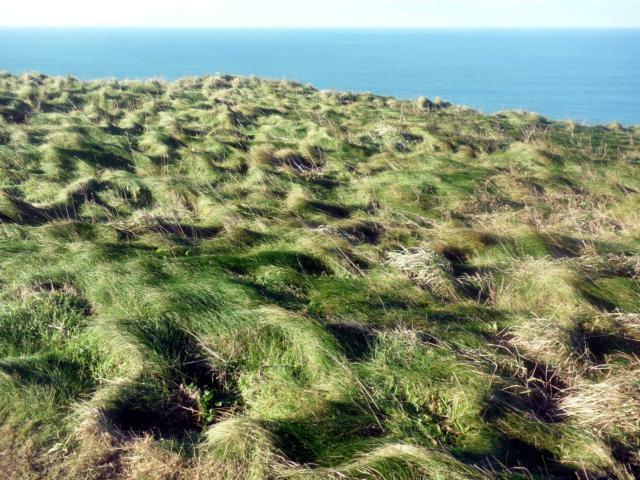 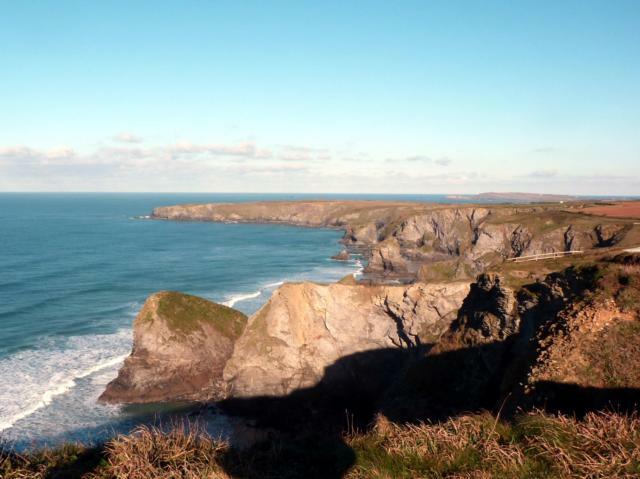 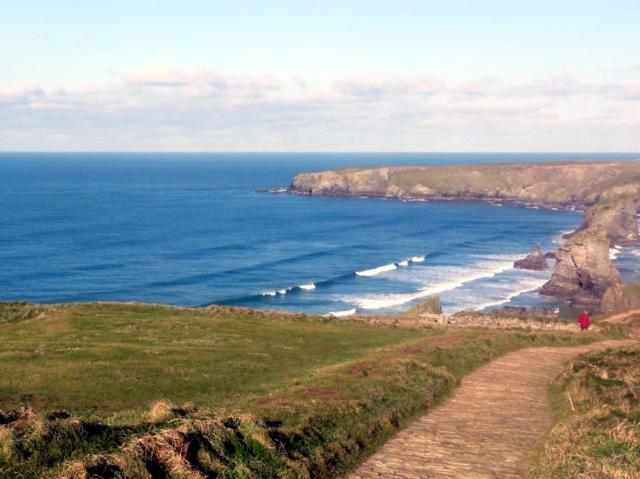 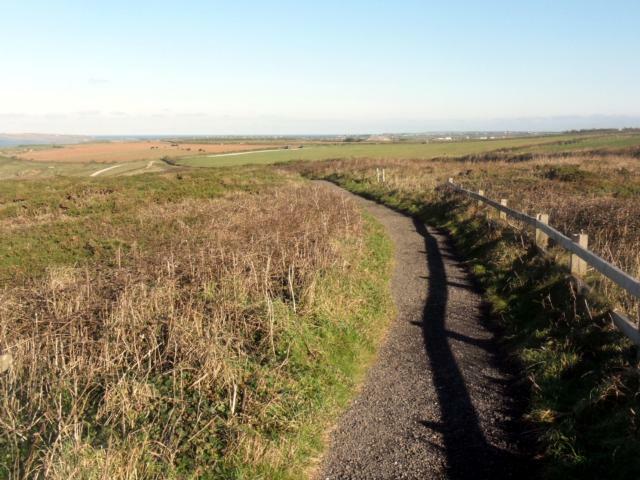 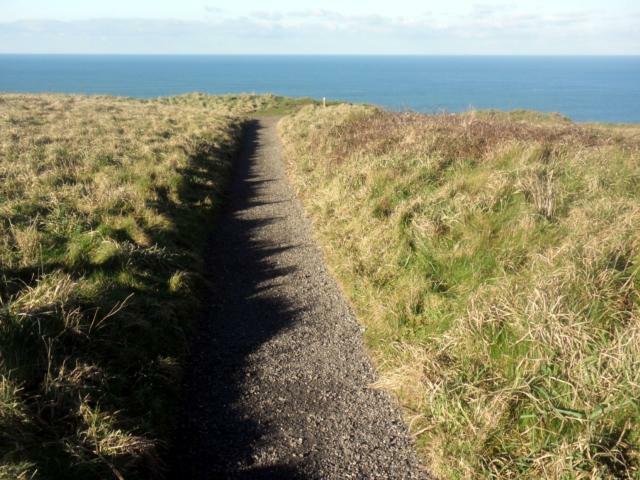 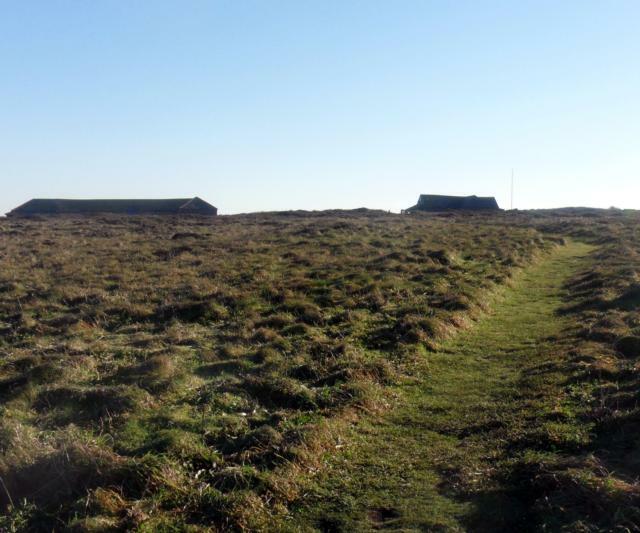 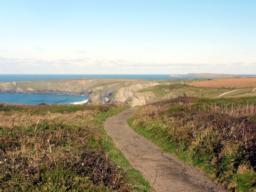 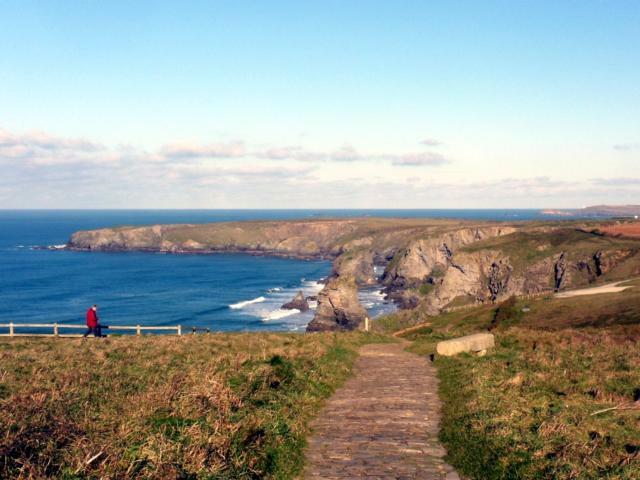 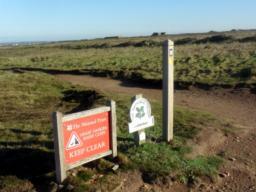 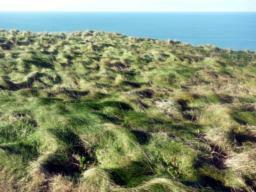 A short, stimulating trail at one of the most iconic destinations on the North Cornish coast. 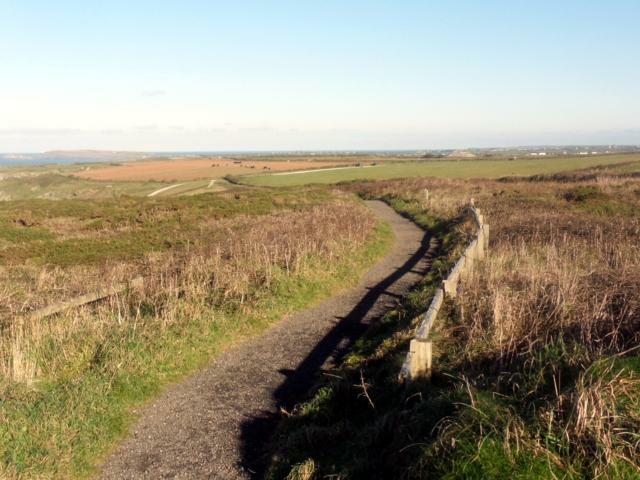 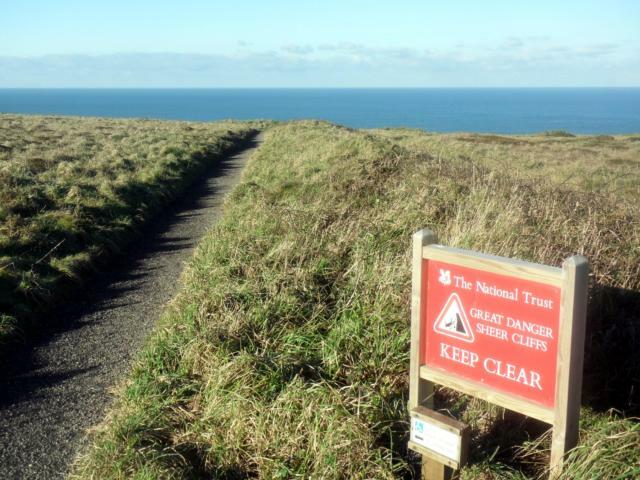 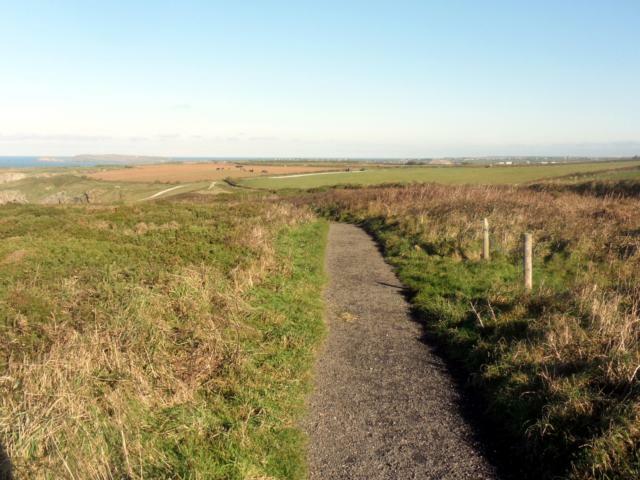 Parking in the National Trust Carnewas car-park (PL27 7UW - fee payable for non-National Trust members) this trail takes you out onto the South West Coast Path with sea views from Newquay past Park Head to Trevose Head. 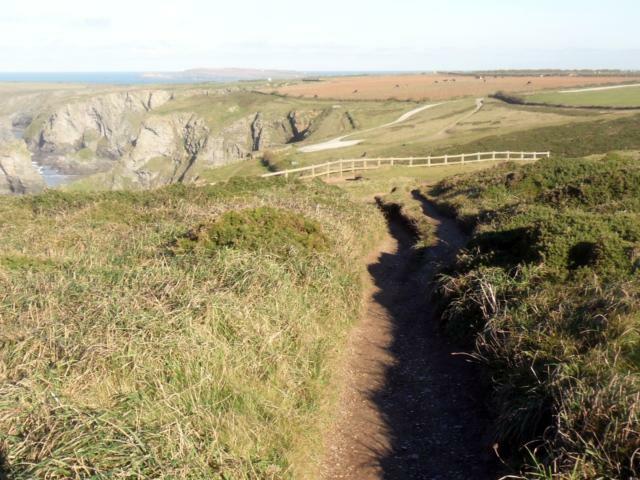 The path is level and well surfaced for most of the route but there are a number of steps leading down to the Bedruthan Steps lower viewpoint making this section impassable for wheelchairs and even trampers. 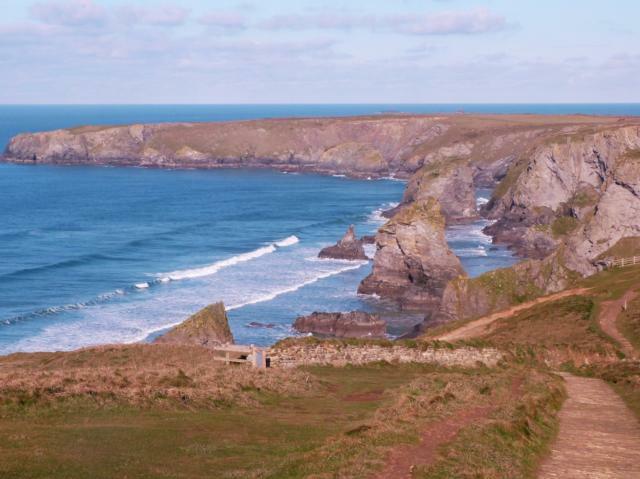 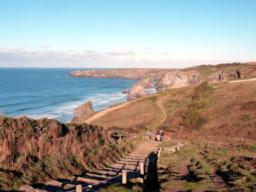 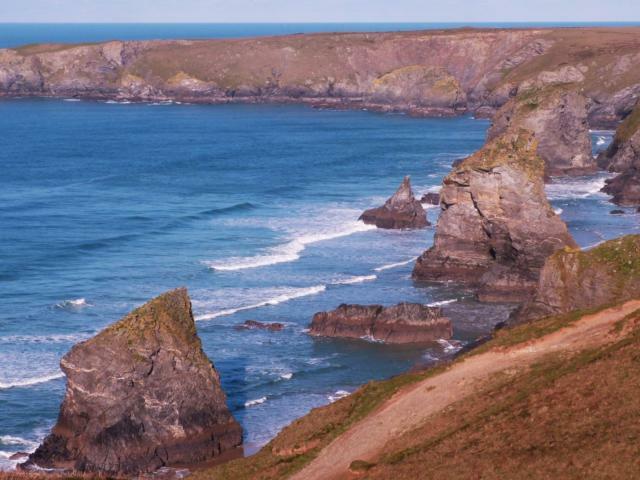 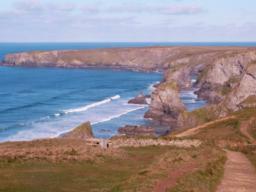 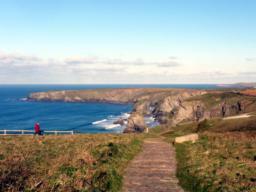 However, the higher viewpoint still gives stunning views of the sea stacks of Bedruthan Steps. Beware of the cliff edge which is unfenced in places. 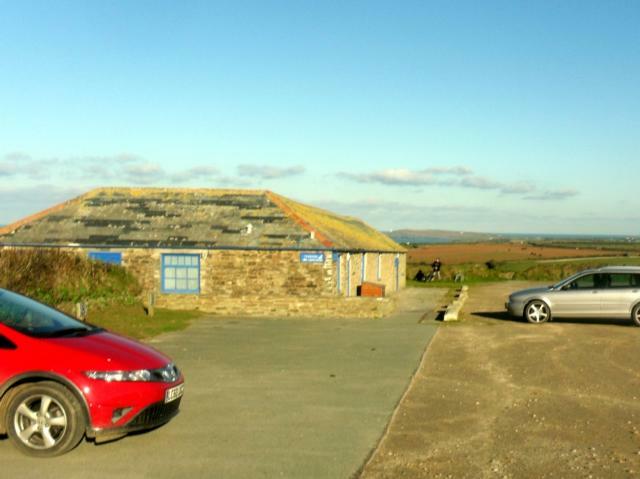 The car park has toilets, a shop and a popular tea room (open weekends only from November to March). 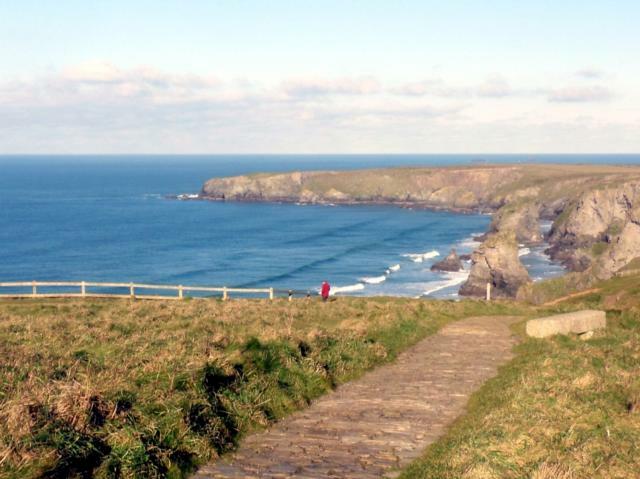 Public Transport: The Western Greyhound Bus 556 travels between Newquay and Padstow passing Bedruthan Steps. 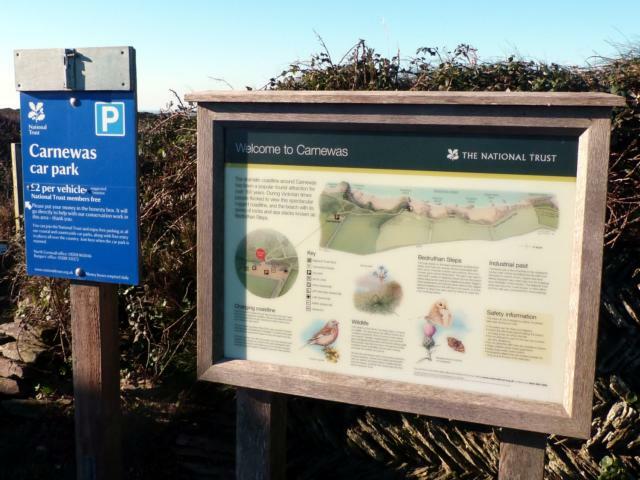 Car Park: National Trust (Carnewas) Car park - PL27 7UW. Fee payable for non-National Trust members. 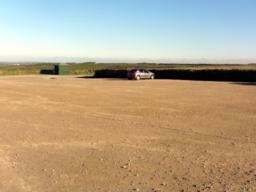 This car park is very busy in high summer. 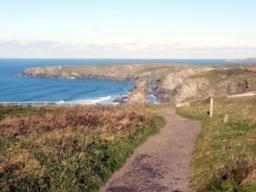 Steps: If going down to the lower Bedruthan Steps viewpoint there are a number of rugged stone steps. 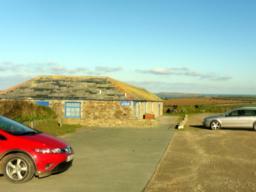 Toilets: At National Trust (Carnewas) car park next to the cafe. 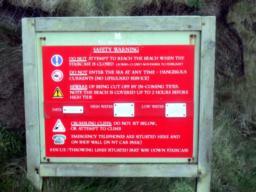 These will be closed when the cafe is closed. 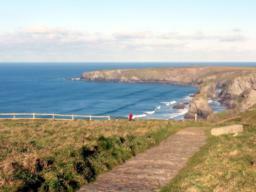 Nearest other toilets at Mawgan Porth. The start of the walk at Carnewas National Trust Car Park. 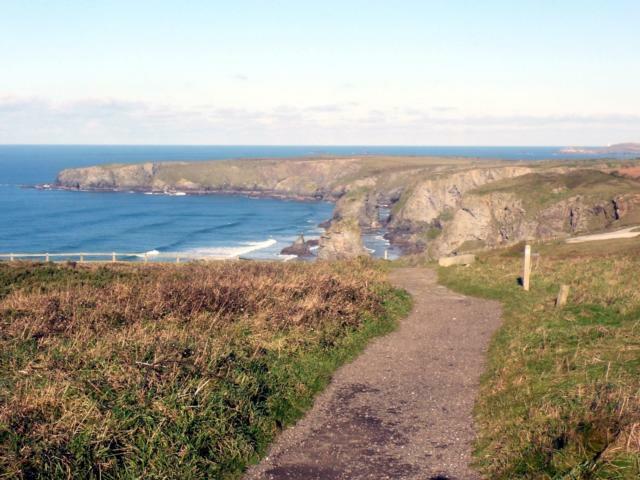 Turning left away from Bedruthan Steps towards Carnewas Point, the path changes to an earthy, uneven surface wide enough for trampers. 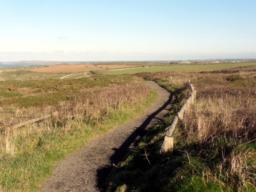 Looking back and to the left there is a grass path back to the car park. Here a large stone and a muddy patch need to be avoided. 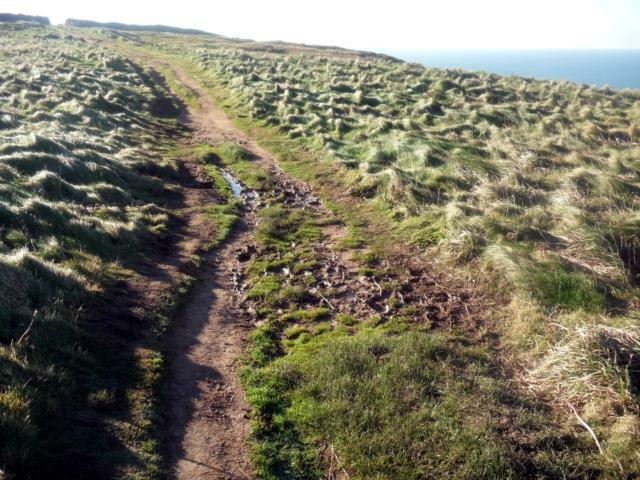 The path keeps its width but has muddy areas after rain. 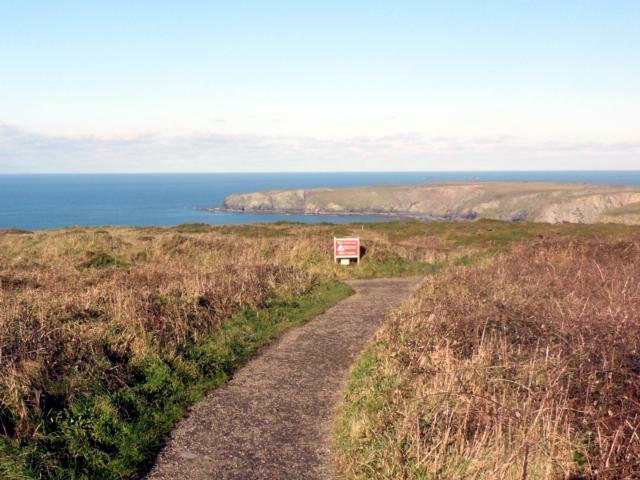 The gateway, between a Cornish Hedge, leads onto a path that is uneven and not suitable for wheelchairs, pushchairs or even trampers. 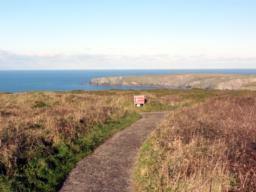 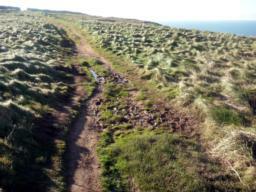 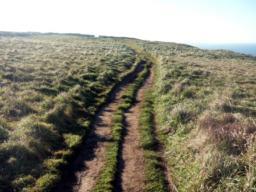 The SWCP leads to Mawgan Porth from here. 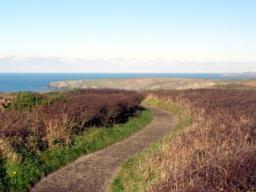 Turn round here just past Carnewas Point and follow the path back towards Bedruthan Steps. There is an alternative path back to the car park. 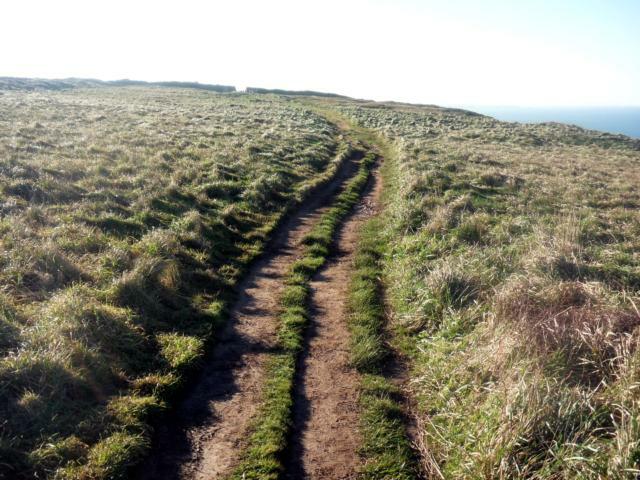 The surface here is of loose earth . Beware of the stony path at this point. 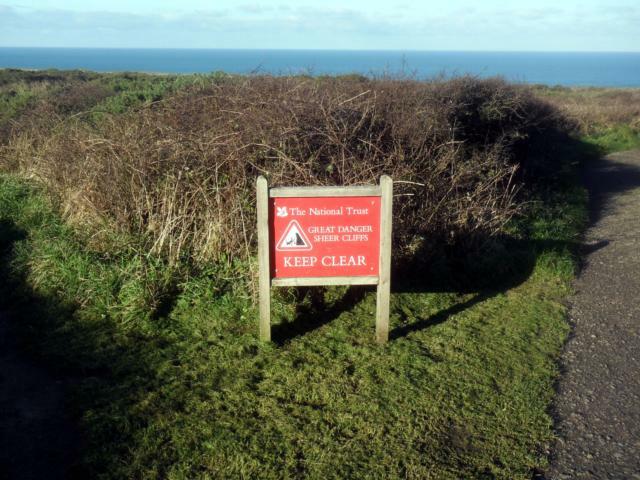 It is possible to bypass this. 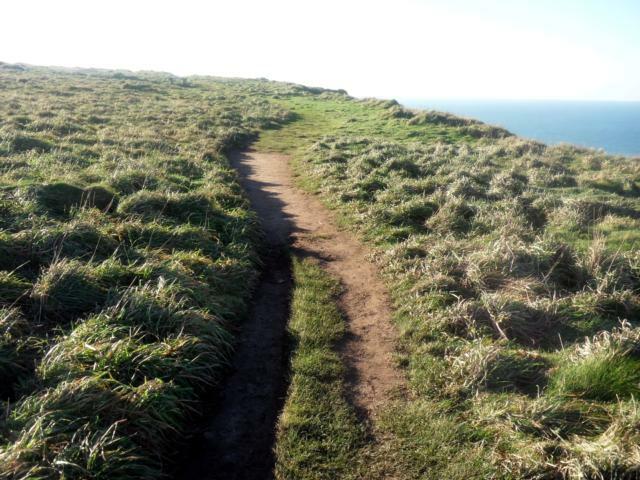 The path is narrow - less than a metre in places. 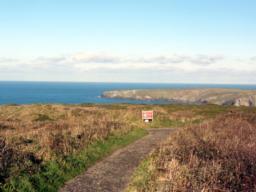 Pendarves Point in the foreground, Park Head in the distance. 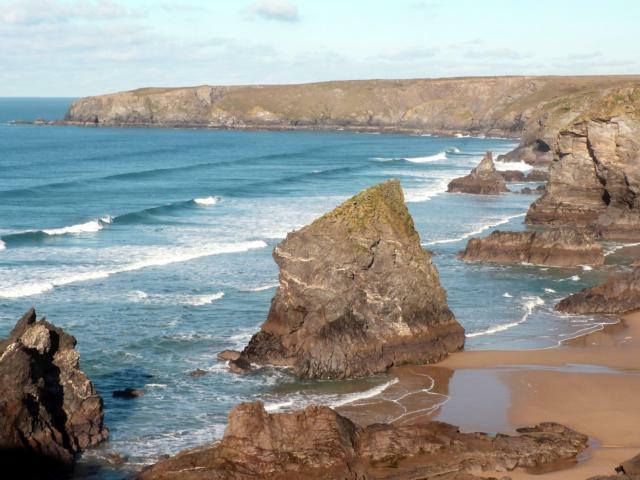 A view of Bedruthan Steps. 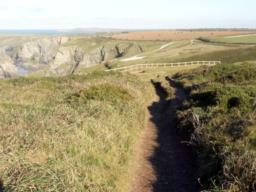 The tiled slate path descends towards Bedruthan Steps at a decline of 1:25. 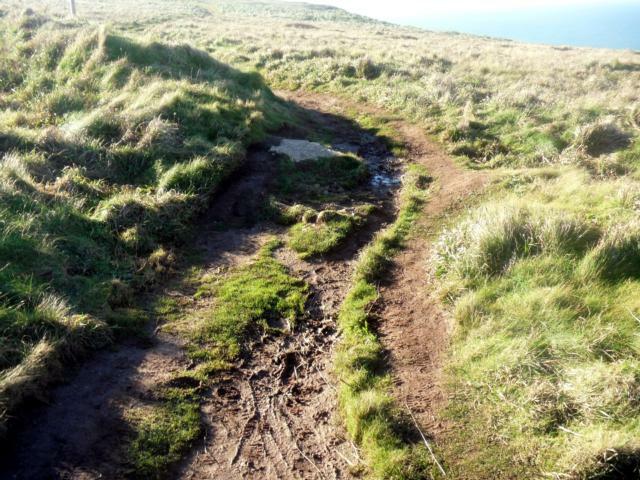 It looks to be very slippery in wet weather. 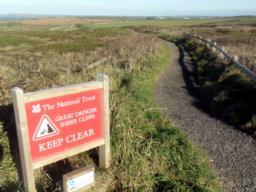 At this point you may like to turn around and make your way back to the car park. 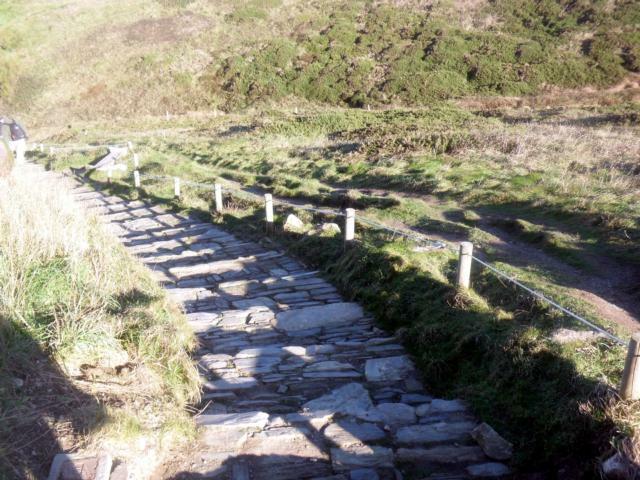 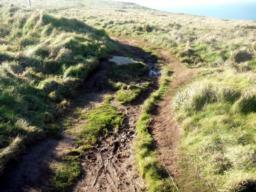 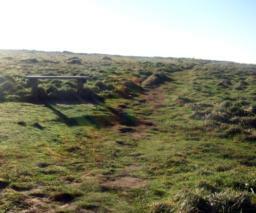 ... the path turns to rough stone steps and descends at a gradient of 1:15. 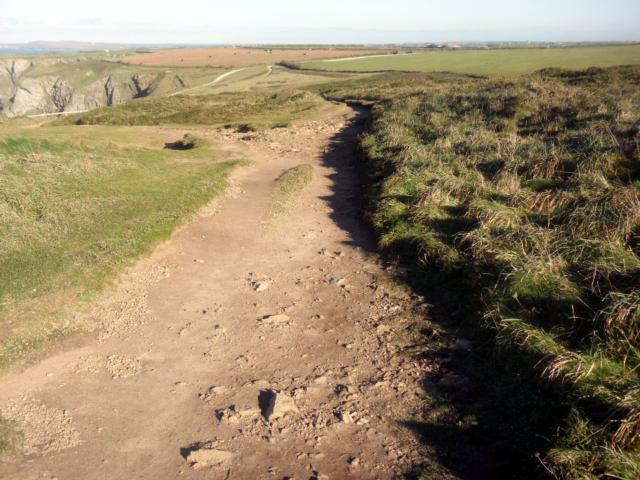 Those of at least, moderate fitness may like to continue down slowly to the lower view point. 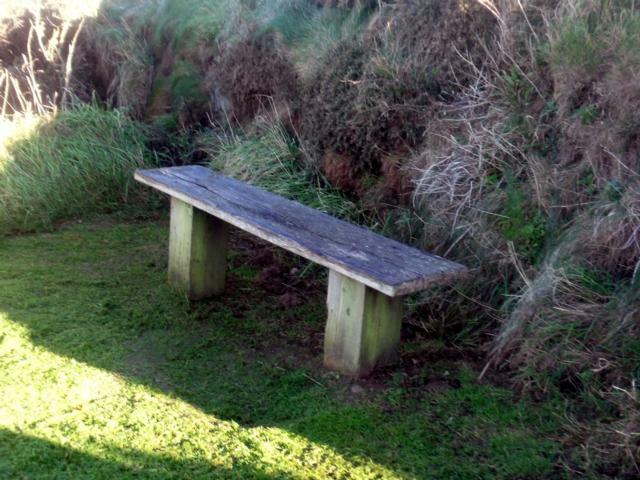 There is a seat halfway down the steps!! 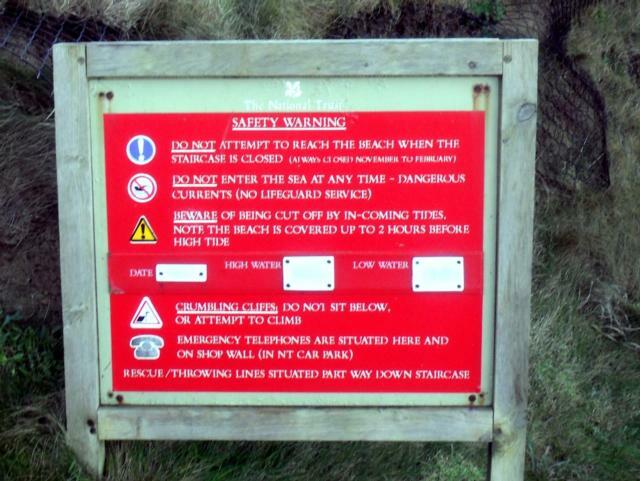 The steep staircase to the beach is closed from November to February. 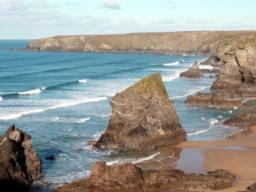 Bedruthan Steps as seen from the lower viewpoint. 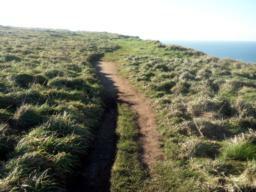 climbing back up the path, the view is still stunning. 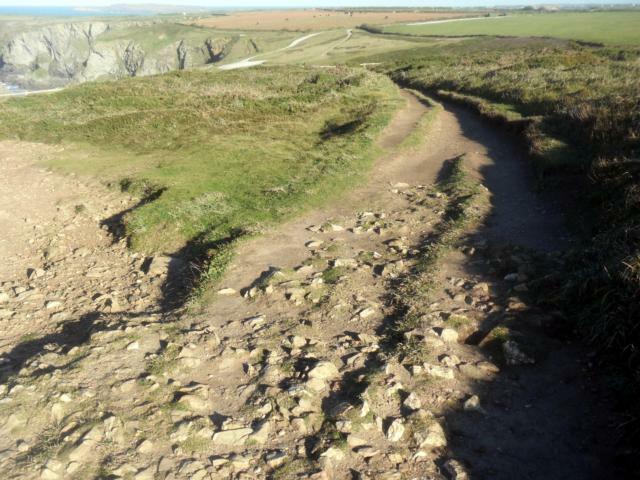 The surface changes from tiled stone to compacted earth and then to loose gravel as the path nears the car park. The path meets up with the path you took on the way out to Carnewas Point. The car park in mid November was almost empty. It's not like this in mid summer!